With the Sure-Fit, you can have quick access to your entire bed. Just un-snap the cover and roll it up to the cab. It's that simple. The Sure-Fit has an anodized aluminum construction combined with a UV resistant vinyl top that is made to last. All of the components and hardware are finished in black for a sleek, factory look. The Sure-Fit has snaps running down all four sides of the bed. This means you can un-snap it anywhere along the bed and have immediate access to your stuff inside. The tension bows on the Sure-Fit keep the cover taught and arch it slightly so that water rolls off the sides and doesn't sit on the vinyl or get into your bed. The Sure-Fit can usually be installed in less than 30 minutes with a few basic tools. All necessary hardware and instructions are included. Drilling is required on some applications. The Advantage Sure-Fit is protected by a limited lifetime warranty. The all black tonneau cover at an unbeatable price to give your truck better gas mileage, a sporty look and easy functionality. The Advantage Sure Fit superior functionality and a sleek, classy look. The Sure Fit tonneau cover assembles and disassembles in a hurry and is one of the easiest soft tonneau covers to install. 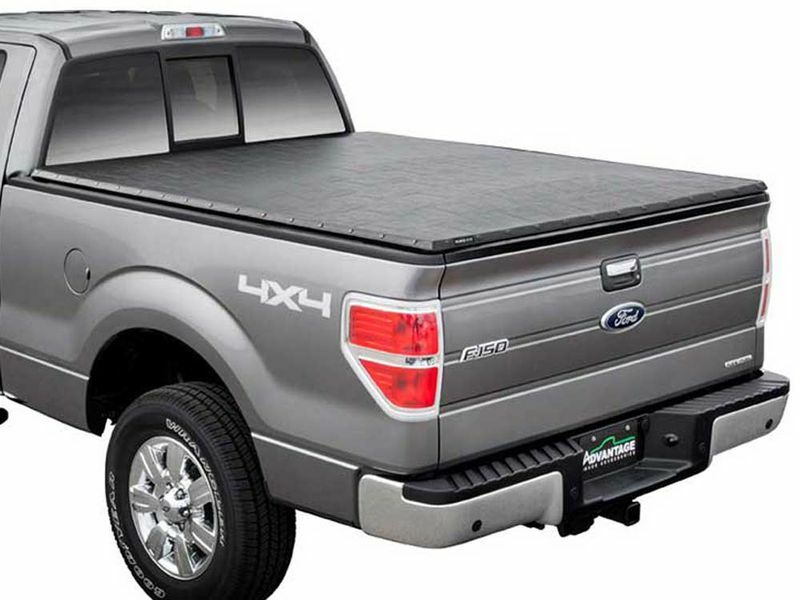 Extang kept functionality in mind and this tonneau cover is made for those who need quick and easy access to their truck bed without an expensive roll up tonneau cover. The moveable snaps makes sealing the tonneau cover easy and you can release them with the flip of the finger for quick removal. Simply roll it up and latch in place for full bed access. Couldn't be easier. Because of the materials used to make this cover, you can rest assured that it will last for years. If you're looking for a cover that offers easy bed access, than the Sure Fit is the way to go. It features snaps on all 4 sides of the cover, so if you need to get access to the front of your truck bed, simply grab the corner and open it up. The Sure Fit also features an exclusive lever lock system that makes for easy removal if large items need to be stored in your truck bed. The entire cover can be removed in minutes to allow for full bed access. Although hard covers offer the most security, you can also rest assured that your valuables are "out of sight, out of mind" with this soft bed cover. The tarp is durable and the bows are built strong to hold up against any element that gets thrown its way. Rain or shine, your cargo will be kept safe and dry. The installation of the Advantage Sure Fit is simple. It's usually a no-drill installation and it can be done with a few basic tools. It's a clamp on application that can be completed in about 30 minutes. All of the required components for a successful install including instructions come with the cover. The Advantage Sure Fit is covered under a Limited Lifetime Warranty. With this long of a warranty, the cover will probably out last the life of your truck.